We've talked about lots of regal aquamarines already this March, but today I've got something a little more unusual for you: an ultra-modern aquamarine brooch owned by a fascinating British princess. 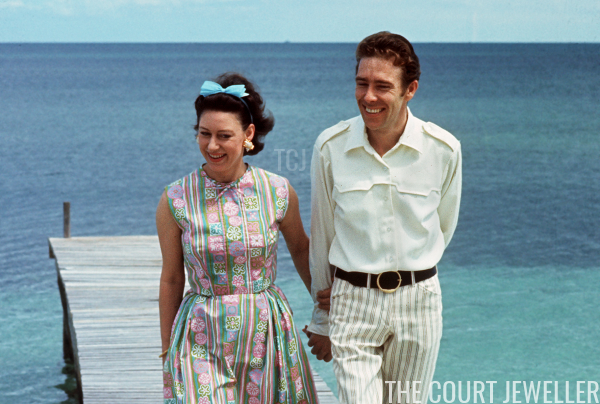 When you think of the British royal family and modern art in the twentieth century, your mind probably immediately goes to Princess Margaret and her artistic husband, Lord Snowdon. Their circle of friends included numerous creative people. In the 1960s, Tony introduced Margaret and the Queen Mum to a new British jewelry designer, John Donald. Both women bought modern pieces from his collections, though the Queen Mother's purchases were generally gifts for Margaret. Christie's notes in their write-up of the brooch that those gifts included "the occasional aquamarine-set piece." 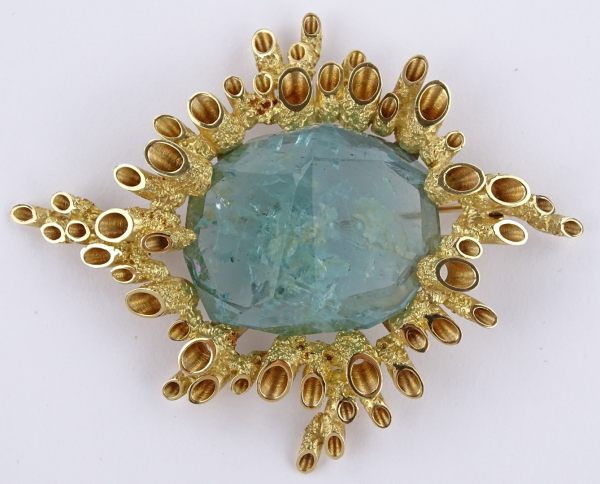 One of Margaret's most interesting pieces from Donald was this gold and aquamarine brooch. 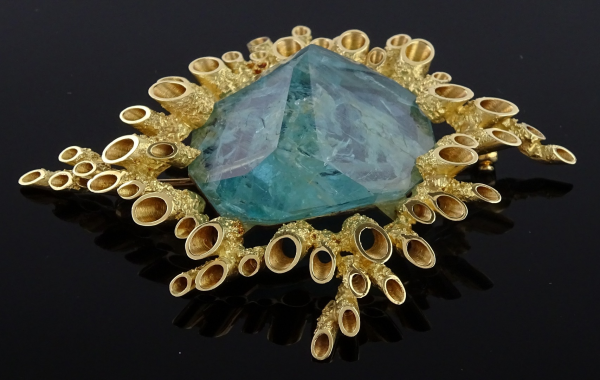 The unusual aquamarine in this brooch was faceted by Donald himself, with the cuts designed to be intentionally irregular. He then set the stone in an unusual cluster of 18-carat gold tubes. Marks on the brooch indicate that he completed the piece in 1967. Margaret's collection of jewelry pieces by Donald also included this pair of aquamarine, gold, and diamond earrings, made around 1970. 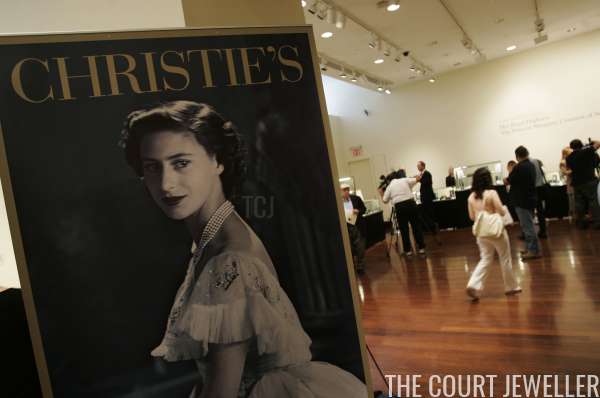 In 2006, four years after her death, Margaret's children decided to sell numerous items from her estate at Christie's, including many of her jewels. 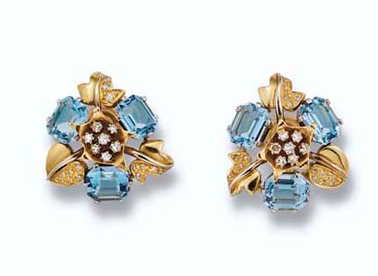 Both the aquamarine brooch and the aquamarine earrings by John Donald were included in the sale. The aquamarine earrings, estimated to sell for between 2,000 and 3,000 pounds, fetched 12,000 pounds. The brooch also blew past its estimate, selling for 14,000 pounds, rather than the expected 1,000 to 1,500 pounds. Each piece was accompanied by a certificate of authenticity from Kensington Palace, signed by Viscount Linley. The brooch's certificate is shown above. Many royal jewels sold at auction are destined to appear again and again at various sales, with the owners hoping to capitalize on the piece's royal provenance. This was the case for the brooch, which has already been sold for a second time. In September 2018, it was offered for sale by Burstow and Hewett, along with several other pieces from the late princess's estate. This time, though, the brooch's royal provenance didn't carry it quite so far; it fetched 7,000 pounds, half the price it had realized a decade earlier.